The aswang which is probably the most well-known monster in Filipino folklore was mentioned in a recent tweet by the popular Mexican film director Guillermo Del Toro. 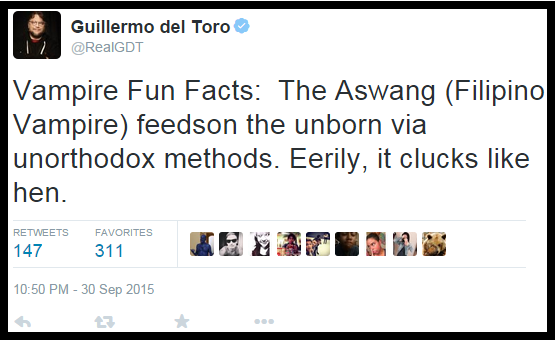 The famed director tweeted, "The Aswang (Filipino Vampire) feeds on the unborn via unorthodox methods. Eerily, it clucks like hen." The tweet is one of several he wrote about Vampire Fun Facts. Prior to his tweet about the aswang, Del Toro also tweeted about the shroud-eaters in ancient Europe and the "stake through the heart" method of eliminating vampires. The aswang myth is especially prevalent in the Visayan region (Capiz, Negros, Aklan, Siquijor, Iloilo, Bohol, and and Antique). In fact, over the years, numerous accounts of aswang sightings in said provinces have been reported on the media. Descriptions of the aswang vary. However, they are usually described as shape-shifters. This means they have the ability to transform from humans into animal creatures like dogs, cats, and birds. The mythical monster has been featured numerous times in Filipino movies, television shows, documentaries, novels, and comic books. With Del Toro tweeting about the aswang, does this mean we'll be seeing it one of his movies soon? Unlikely but it's good to hear that the famous director has at least noticed one of the most important figures in Filipino folklore and mythology. It's not surprising at all that Del Toro knows about the aswang. The man has shown an immense passion for all things monstrous and bizarre. He is after all the director behind such films as Cronos, Mimic, The Devil's Backbone, Blade II, Hellboy, Pan's Labyrinth, Pacific Rim, Hellboy II: The Golden Army, and the upcoming romantic horror Crimson Peak.